We're happy to exclusively reveal the news that the hit indie puzzler Q.U.B.E. 2 is making its way to Nintendo Switch in both digital and physical form later this month. Q.U.B.E. 2 is a much-loved puzzler that originally launched on PC and other consoles last year. Featuring more than 80 puzzles in total, the game puts players in the shoes of British archaeologist, Amelia Cross, who, with the help of fellow survivor, Emma, must face the challenges of the Q.U.B.E. in the hope of finding a way back home from the ruins of an ancient alien landscape. Developer Toxic Games has partnered with Super Rare Games to release a physical version of the game on the console, as well as the standard digital version. The Super Rare physical edition will include a 12-page full-colour manual, interior artwork, an exclusive sticker, and three trading cards randomly selected from a five-card set. This marks the first time that the Q.U.B.E. series has seen a physical release; only 4,000 copies will be printed and pre-orders are set to go live on 13th February. The physical edition and extra goodies will cost £29.99, or you could choose to pick up a digital copy from the Nintendo eShop with a 15% launch discount. Prices on the eShop will be set at £22.99 / €25.99 / $29.99 when the game launches on 21st February. Are you a fan of the Q.U.B.E. games? Will you be picking this one up on Switch? Let us know whether you'll be going for the physical or digital version in the comments below. Count me in. Now i have to prepare to preorder quickly as 4,000 copies is crazy low! @jockmahon or poor WOMAN's portal. C'mon man, this is the 90's. Get with it. D'oh it was meant to be a secret. @aznable @jockmahon shouldn't it to be a "variable wealth, non assigned gender version of non descriptive portal creation game"? What, are ya gonna beat my ***? Looks cool, guess I'll grab a copy. @GauBan @aznable @jockmahon This is an outrage. If anything, it should be a "Poor person's Portal" - but now you're just being insensitive to the poor. Please allow me to be offended on their behalf. EDIT: But seriously, on topic, @CurryPowderKeg79 I've never had an issue with ordering any of their games. As long as you check within a couple days of launch, you should be fine. Why is it @GauBan that i fell where having the whole Piranha Plant debate again? Q.U.B.E. 1 on the Wii U was pretty fun, so I will probably get this. I've been playing Qube 2 on PC and it's a really enjoyable puzzle game. If you guys don't get the physical, get it digitally, it's a fun game. 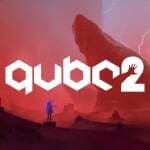 @KimBread Makes me wonder if I'd miss anything by skipping Q.U.B.E. 1 to play Q.U.B.E. 2 on Switch. "D'oh it was meant to be a secret. Now everyone will buy it. ;D"
Don't tell anyone yet... More info soon"
This looks awesome!!! I’ll be downloading it since im here in the states, and Super Rare Games are european. That means im super o.c.d. about how my collection looks and those spine label differences stop me from ordering from them. Its the only reason i order from Limited Run and EastAsiaSoft. Didn't realize Q.U.B.E. even had a sequel. Thanks NL for pointing out this game. I added the game on my Steam wish list and will later pick it up. It's a great game for people that already played the Portal games and maybe even Narbacular Drop, and still crave more goofy first person puzzles. All you can do now is rush with the rest of the sheep to buy the left overs. victory is mine. Lol being honest it''s better for Super Rare to mentioned as much as possible. They are great guys and do not suffer from the Limited Run Games rush , yet. @CurryPowderKeg79 too much Fortnite. They should go play StarDew Valley. Acually @jockmahon it's not the poor mans Portal when it cost $60 bucks to get it to your door. @RupeeClock Well, Q1 isn't particularly story heavy from what I remember, so you're probably okay in that regard.